PEGASUS will be equipped with the aforementioned Langmuir probes and will provide information about essential properties of the plasma in the thermosphere such as the electron temperature and –density. In order to ensure the capability to collect and downlink the data over several months, PEGASUS requires about the same types of subsystems as one would find on large-scale satellites. This includes an attitude control system, an on-board computer, telecommunication devices, an electrical power systems allowing to harvest the solar power and either distribute or store it for later use, a thermal control system – to name only some. In addition to the above, PEGASUS will also feature a propulsion system which, if successful, would be the first time to use such a system on a nanosatellite. 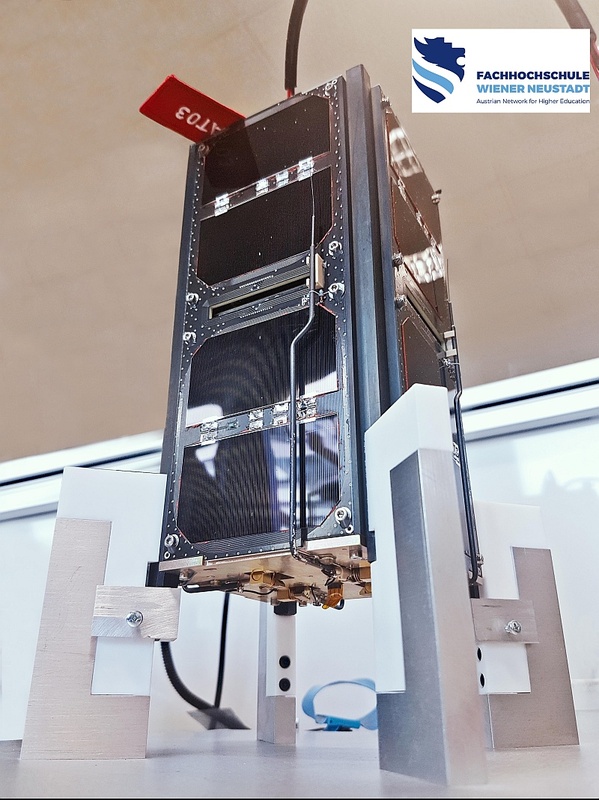 In order to ensure PEGASUS capability to fulfil its mission, PEGASUS requires almost the same types of subsystems as one would find on large‐scale satellites. This includes an attitude control system, an on‐board computer, telecommunication devices, an electrical power system allowing to harvest the solar power and a thermal control system – to name only some. In addition to the above, PEGASUS will also feature a propulsion system which would be the first time such a system is used on a nanosatellite. Although it is lightweight, the satellite structure must sustain the extreme vibration, shock (up to 2000 g) and noise environment (exceeding 140 dB) of a launch. In order to ensure that the structure can endure such loads, Finite Element Methods (FEM) were used during the design process of the structure. Furthermore PEGASUS structural elements have dual use insofar as the parts of the structure contain magnetorquers which will be used to control the alignment of the satellite in orbit. The thermal environment and the resulting thermal loads in a LEO orbit are as challenging as the mechanical loads. In the PEGASUS orbit one can expect surface temperatures between ‐60°C up to 120°C. Internal temperature will vary somewhat lower with ‐20°C up to 40°C. Beside the cyclical thermal loads resulting from this (up to 16 times per 24 hours), the internal electronics of PEGASUS have to be protected using MLI and heaters for particular sensitive elements such as the batteries. The PEGASUS OBC features a 32bit ARM microprocessor which can run with up to 120MHz. Furthermore it provides two redundant 1Gbit flash memories and the data can be downloaded via two redundant interfaces with the TT&C. The processor stores its program code inside its flash memory. A copy is also stored on a separate magnetic memory. A radiation tolerant microprocessor is used as watchdog and programming controller. For safety reasons, the OBC is supplied via two redundant power lines with automatic switch over and latch‐up protection. which is supplemented by two redundant communication and backup controller which can maintain basic functionality even if the main controller fails. The Attitude Determination and Control Subsystem uses embedded sensors (photodiodes , 3‐axis magnetometers) and actuators (multiple magnetorquers) and a propulsion module (Pulsed Plasma Thruster ‐ PPT) enabling rotation around x‐ and y‐axis and translation heading towards +z. Furthermore a GPS receiver is utilized for accurate position determination and to synchronize the real‐time clock. In addition a 3‐axis gyroscope is being utilized for better rotation measurement. STACIE‐∆ (Space Telemetry And Command Interface) The Telemetry, Tracking and Control System (TT&C) of PEGASUS operates in the 70cm amateur radio band. It features two redundant transceivers with corresponding controllers on one board. Both transceivers can be powered and controlled independently. A very unique feature is the possibility to remotely change the transmission frequencies from the ground station. PEGASUS will feature a unique propulsion system, a so‐called Pulsed Plasma Thruster (PPT). The propulsion system will provide a Δv of 3.4 m/s which, under optimum conditions, can extend the duration of the mission several months beyond the planed one. No nanosatellite has managed to fly such a system before. PEGASUS will be equipped with the mNLP – multi Needle Langmuir probe system, developed by the University of Oslo. With this instrument, PEGASUS will measure the electron temperature and –density in the thermosphere. Those measurements will provide an essential input into the understanding of the plasma conditions in the upper atmosphere and the processes which determine our global weather. The TT-64 protocol regulates the data transfer between the satellite and the GS in both directions (air interface). The TT-64 protocol supports the time division multiplex method (semi duplex communication). A complete data packet consists of a 70 bytes string, whereas 6 bytes are created automatically by the TRX module of the communication interface STACIE for synchronizing and receiver tuning. The remaining 64 bytes are data bytes. The last 18 bytes are used for CRC and FEC. The satellite was ejected into a sun synchronous orbit with an initial altitude of ~380 km and an inclination of ~98° on June 23, 2017.